Contrary to popular belief, tomatoes are not just used to make ketchup. They make an excellent health food. Add this sweet and juicy fruit to your diet, as the health benefits of tomatoes include cancer prevention and cholesterol control. There can be no doubt that the addition of tomatoes – sliced, dried, or in a sauce – can turn any dish delicious, but with it, you can also experience the enormous health benefits of tomatoes. So don’t forget to add tomatoes to your salad! Many of the health benefits of tomatoes are due to the presence of the antioxidant lycopene in these fruits. Doctors have always recommended the regular consumption of tomatoes. This fruit, grown originally in South America, is considered to be rich in vitamins C, E, B6 and A. It also contains potassium, flavonoids, and several mineral salts. Also, eating tomatoes during summers keeps your body cool, as they are high in water content (14 kcal per 100g). As tomatoes are low in saturated fat, calories, and sodium, one of the essential health benefits of tomatoes is cholesterol control. Consuming at least one serving of tomatoes daily will ensure that you get the required amount of fiber (7%) per day. The niacin, thiamin, magnesium, copper, and phosphorous present in tomatoes help in countering high blood pressure, heart diseases, and strokes. To top all of these benefits, this nutritious fruit is simply delicious! The antioxidant, lycopene, has been known to remove harmful free radicals found in the body. This is found in tomatoes in high quantities. 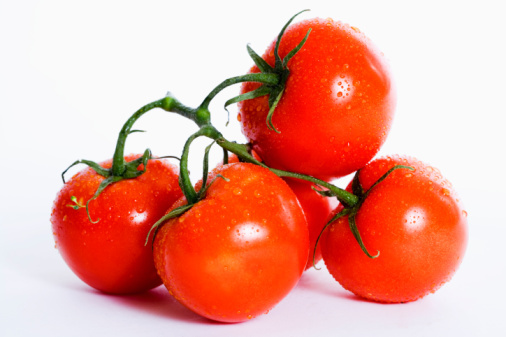 Lycopene prevents age-related macular degeneration, breast, prostate, and stomach cancer. In the West, over 85 % of the population consumes this fruit in order to be protected from UV rays. While there is no absolute proof that lycopene fights cancer, various medical studies have shown that its increased intake does prevent it. Research conducted by Cancer Epidemiology, Biomarkers & Prevention, has shown significant reduction in prostate cancer cases in a group of 900 men with high lycopene consumption. As Lycopene fights free radicals, it helps reduce fine lines and wrinkles that normally occur when people are in their 30s and 40s. According to the studies conducted by the Department of Dermatology, Charite University, a direct link has been discovered between lycopene and wrinkle-free skin. In order to gain the full health benefits of tomatoes, you need to consume the whole fruit. Calcium and Vitamin K found in tomatoes help in building and maintaining strong bones. Tomatoes also help in improving bone mass and are effective in countering osteoporosis. The antioxidants found in this fruit, again, keep the bones strong. In fact, tomato juice is a good way to repair and strengthen weak bones. Reduces The Risk Of Heart DiseaseThe cardiovascular system is a vital component of the body. Tomatoes are high in antioxidants and their consumption controls the oxygen supply in the body. The lycopene in tomatoes is a useful and necessary antioxidant that ensures a healthy cardiovascular system. It is also responsible for giving tomatoes their reddish hue. According to research, Lycopene protects body cells that help prevent inflammation, blood clots, and strokes. The Kuopio Ischaemic Heart Disease Risk Factor Study, conducted by the University of Finland, showed that consuming tomatoes daily reduces the chances of stroke by 55% in both men and women. As tomatoes contain Vitamin A, eating them improves vision and is also a good way of countering night blindness. The lycopene in tomatoes also helps counter macular degeneration, which is usually considered permanent eye impairment. Perfect vision is also one of the health benefits of tomato. The beta-carotene component found in tomatoes is an amazing protector against UV rays and makes the skin less sensitive to sun damage, which means you can enjoy beautiful and wrinkle-free skin by eating tomatoes daily. Also, vitamin A makes your hair stronger and keeps it shiny and smooth. The tomato can be consumed in salads, pastas, a variety of other dishes. This wonder fruit appeals to children and adults alike. The health benefits of tomatoes allow you to live longer, healthier, and disease-free. This entry was posted in Nutrition and tagged health benefits of tomato, tomato health benefits by Zipheal Editorial Staff. Bookmark the permalink.